When you have a request from an author on goodreads you can’t help but check out their books and I’m so glad I did. 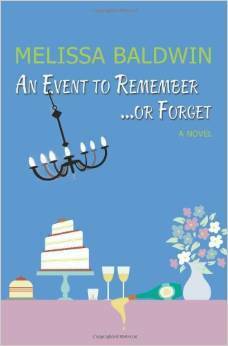 Melissa Bladwin’s debut book, An Event to Remember…or Forget, was adorably charming. It’s the perfect escape into a new world in sunny California. The beginning was a bit difficult to get into but once I did I was completely lost in the story and couldn’t put it down. The mix of humour and sarcasm makes for a perfectly light and fun read. There’s a number of love and hate characters throughout and a few love to hate, which made it a very realistic view of life, it’s never what we seen and people are all extremely different. I loved Sienna’s friends because they were the perfect comparison to her and all their talk of cookies and baking made me itching to get in the kitchen and make some goodies of my own. But really this book has to excited and motivated to plan a huge event and mingle in fancy dresses and sliver linens. If you’re looking for an escape from the world then jump into sunny California with Sienna and her friends for a light and enjoyable read. My only regret is that I wasn’t sitting on a beach with a cocktail whilst reading! Can’t wait to dive into the second book next!